Rumors are brewing in the land of Sapphire of a mysterious guest that has just arrived. According to the brave warriors that managed to catch a glimpse of the shadowy beast, its figure resembled a tiger but did not seem of this world. Scholars from Astral City has speculated that this Spectral Tiger has come from the Underworld and is directly related to Hades, the Lord of the Underworld. As the personal mount of Hades, the Spectral Tiger is a true force to be reckoned with. It’s exclusive skill, Shadow Ward, gives your entire squad a powerful buff at the start of battle that greatly enhances their damage and defense. This provides a great balance between offense and defense for a well-rounded squad. Additionally Spectral Tiger passively increases your character’s HP, attack, physical and magical defense, and agility by a substantial amount. 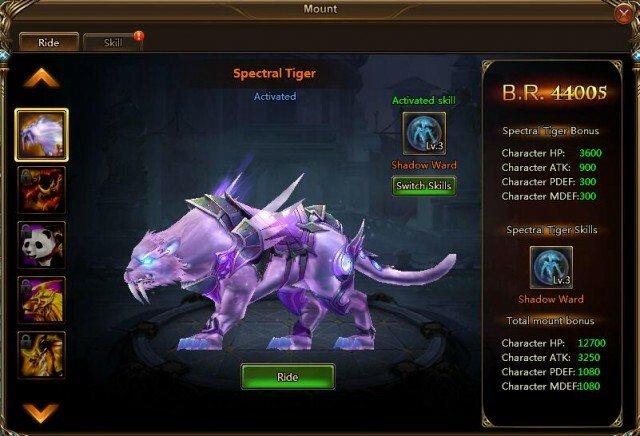 Follow the ghostly trail of the Spectral Tiger to uncover the ancient secrets of the Underworld. This new mount will be arriving in League of Angels II on August 6th, and availabe in the Lucky Tree until August 8th. Don’t miss this limited opportunity to sign a contract with the former mount of Hades’ himself, as well as a number of other rewarding events to enjoy. Play the massively popular fantasy MMORPG today right from your browser and completely free!